For reasons that are obvious, Boogie2988 would remind you of the rap star, Eminem and his 2002 song, Cleanin’ Out My Closet. In the quite controversial song, Marshall Mathers lashed his dad for abandoning him when he was still a kid and crucified his mom for doing drugs and taking out her life frustrations on him. In all, Eminem via the song related that he had a rough time growing up and was mad at his mum for how she treated him. Thus, he expressed his hope for her to “burn in hell” and promised he wouldn’t bring his daughter to her funeral. Like the rap star, Boogie2988 has a lot of reasons to wish his mom hell. And, he has learnt to deal with the childhood issues by being Francis, a raging and easily-angered character of his Youtube videos. According to the Youtuber, the scenes created for Francis are very similar to the things he experienced almost every day while he was growing up. And, the videos are just his way of revisiting his ugly past to laugh at it and as well, amuse his viewers. While a lot of people find the Francis videos offensive, citing that Boogie2988 among other things, is making fun of fat people, those who have speech impediment and those with mental and developmental issues, Boogie has argued that he is only making fun of himself. Apparently, he grew up with a speech impediment and has proclaimed that he is developmentally and physically disabled, big and fat. With that, the man has maintained that he isn’t making fun of anyone other than himself. As such, he has no plan to stop making the Francis videos. Apart from the fact that it allows him the freedom to express his acting and to take control of his “dysfunction” and “stupid broken brain”, Boogie once expressed that it’s fun to make the videos. The American video blogger was born on the 24th day of July 1974 as Steven Jay Williams. Records have it that his place of birth was in St. Paul, Virginia. Steven came from a home that didn’t fall short of any of the criteria that makes a dysfunctional family. Through Boogie’s videos, we’ve come to learn that he was a victim of psychological and physical abuse. He was tormented by someone he loved and trusted – his mother. Boogie once described the experience as the biggest abuse he has endured. He detailed that he was physically abused not once a week or month but every day. He was cut, burned with a cigarette and stabbed. At a particular instance, he jumped out of a moving car to protect his eye from his mum’s attack. Boogie said she told him she was that way with him because she promised herself when she had him that she will bring him up the right way and ensure he’s different from his brother and sister. His sister, Karla was taken away to a foster care home because of the abuse she equally suffered. His older brother, Bryan also left home leaving young Boogie alone with his mum. His dad was there but he was always working. This made it possible for Mrs Williams to treat Jay in all sort of inhumane manner. It was so bad he attempted killing himself. The vlogger believes his weight, anxiety and posttraumatic stress disorder (PTSD) were nurtured by the abuse he suffered at the hands of his mother. Bryan gave Boogie the chance to learn how to code to become a web designer. This ultimately led to him becoming a video blogger. His dad died of cancer; in 2009, his mom died as well. Before Boogie divorced his wife, Desiree “Dez” Williams they do work on each and every Francis footage from scripting to shooting, together. From what we gathered, they dated for five years before they eventually got married. That was in 2013. There was a time he expressed that Dez is the love of his life and, that no one ever treated or loved him the ways she did. In fact, he related that one of the women he dated before Dez exploited his depression and suicidal tendencies. She convinced and manipulated him into believing that he would be one of the fattest men in the world and, that she was going to feed him to death for her own sexual gratification. Owing to the foregoing, it was a thing of surprise when Boogie2988 announced on YouTube sometime in December 2017 that he and Dez have decided to get a divorce. He later made a video wherein he confessed that the Dez-Boogie marriage, unlike what viewers may have come to believe from the videos they watch, was far from perfect. The problem he said, was his anxiety disorder and PTSD. Boogie wanted to work out the marriage but Dez wouldn’t let it, she insisted on a divorce and the union collapsed. Nonetheless, the two are still friends and very much interested in each other’s life. While it has been commonly assumed that the value of the vlogger’s wealth is between $700,000 to $1.5 million, we are yet to substantiate any of the figures. As far as we can tell, the man is made for life. At the time of this report, he has almost 4.5 million people subscribed to his Boogie2988 Youtube channel. While Boogie’s weight has been attributed to him finding solace in food following the loneliness that came with the abuse he suffered, it has also being blamed on lymphedema. Already fat Boogie got fatter when he had a lymphatic system blockage that caused a swelling in his leg. The condition made it impossible for him to take part in any physical exercise that would help him manage his weight and maintain physical fitness. His doctor made a move to chop off the leg but Boogie wouldn’t have any of that. Ultimately, the vlogger became morbidly obese. It is said that he weighed as much as 266kg (587 lbs) at some point. 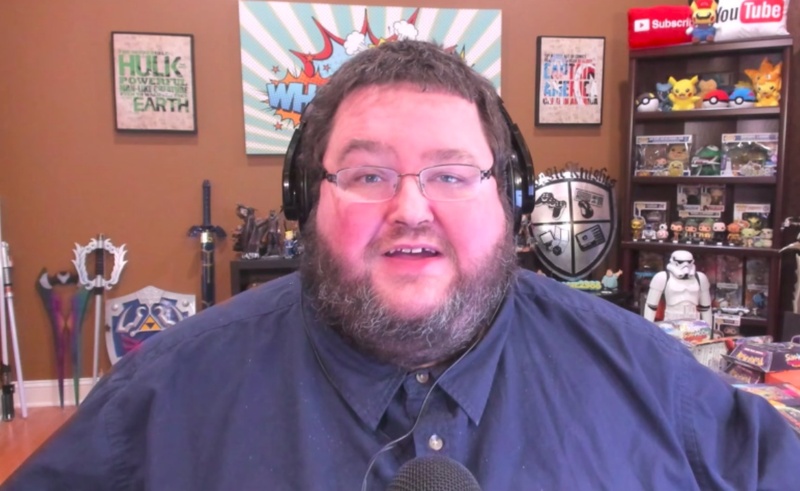 Boogie eventually opted for a gastric bypass surgery which has seen him lost a major bulk of his weight. It is medically expected that he will lose 206 lbs from the surgery. The vlogger is 1.78 m tall.